You get there from San Francisco, after a couple of hours by car. You’re coming from the south, so you see the ocean running along the edge of the bay. A fog could wrap you and everything else (cliffs, panoramic views, life): it rises when the cool pacific breeze meets the warm inland wind (they don’t like each other). But you can see Bodega Bay. The houses overlook it, separated by trees and fields where young deer wander about. The birds are quiet, do not attack humans. They behaved quite differently in Alfred Hitchcock’s movie, which was filmed right here. 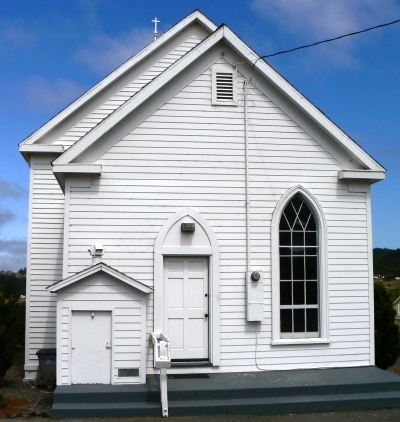 The original church and schoolhouse are still there for you to see. What happened to the angry birds? They must have moved in my neighbourhood. For instance, two seagulls use to scream aggressively over my roof every night by 2 or 3 a.m.; and other restless gulls have been spotted in town. Not to mention the pigeons. But that’s another story.